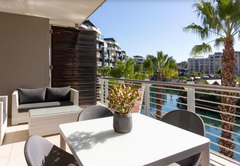 Juliette 307 is a property providing self catering in V&A Waterfront for up to 2 guests visiting the Atlantic Seaboard region. The Victoria & Alfred Waterfront in Cape Town is one of the most popular tourist attractions on the African continent. It is just minutes away from the City Bowl, Table Mountain, Lion’s Head, and Signal Hill; and has the ocean on its doorstep. 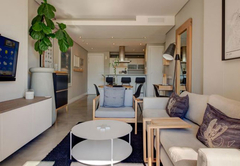 And the pretty marina here is home to Juliette 307 Holiday Apartment; a one-bedroom apartment that is ideal for up to two guests. 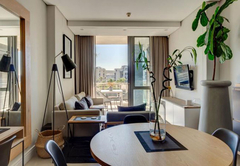 The chic Juliette 307 Holiday Apartment, measuring 90 square metres, has a King-size bed (easily split into two three-quarter beds) in a spacious bedroom that opens out onto a balcony. The en-suite bathroom is modern, and is equipped with a shower and a bath. 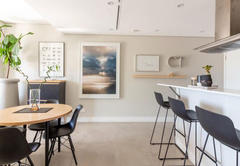 The living area and kitchen occupy one light, open space. 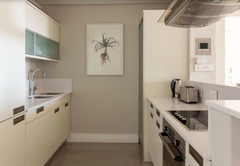 The kitchen has all of the necessary crockery, cutlery, appliances and cooking utensils necessary, as well as a breakfast bar with bar stools. The lounge and dining room are tasteful, equipped with a TV, satellite, and DVD player. The balcony is accessible via large sliding doors, and has chairs, a table, and an unrivalled view. Juliette 307 Holiday Apartment also has heated floors, air-conditioning, bath towels, and linen. Housekeeping can be requested from Monday to Friday. The V&A Waterfront is home to almost 200 shops and around 70 restaurants, as well as the Robben Island Museum. A short walk from the main mall reveals the Zeitz MOCAA Museum of Contemporary Art, other museums, boutiques, and yachts for cruises in the working harbour. 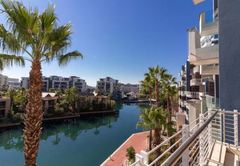 The Waterfront is only 20 minutes from the Cape Town International Airport. 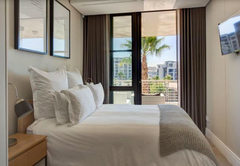 The chic apartment has a King-size bed (easily split into two three-quarter beds) in a spacious bedroom that opens out onto a balcony. The en-suite bathroom is modern, and is equipped with a shower and a bath. Response timeJuliette 307 typically responds to requests in 5-10 minutes. Child policyThe apartment sleeps up to two adults and is not suitable for children.